The Blender Foundation seems to have done a good job making their Cycles renderer work really well with GPU on an Nvidia card. It doesn't work so great on AMD cards (which sort of eliminates Apple machines from the running). But objects set up with Cycles materials can party with fairly fast renders (on Nvidia cards). Weirdly, Adobe seems to also favor Nvidia over AMD graphics. In my experience this means their Mercury playback engine works better on Nvidia which again means that Premiere and After Effects work better on PC's than on Macs. Some ridiculous human (me) is having some old Blender models (which do look beautiful) fly by in a couple scenes and man, they take longer to render than I expect them to. The thing I do desire with all my heart is that there be an easy way to render out a ground plane that is invisible but otherwise accepts shadows in Cycles. There is a kludgey way to do it by rendering out a separate ground plane which is mostly alpha channel with a shadow on it but it involves setting up multiple outputs and you have to composite them back together again in After Effects. And although that's not a nightmare because at least you get to fiddle with the amount of shadow, it's well... it's a kludge. "Kludge" is a word according to my browser's dictionary apparently. Huh. It never occurred to me that Ripley has a watch in Alien. She has one in Aliens. But the one in Alien was not that big a deal. Somebody sells the one from the videogame Alien Isolation. 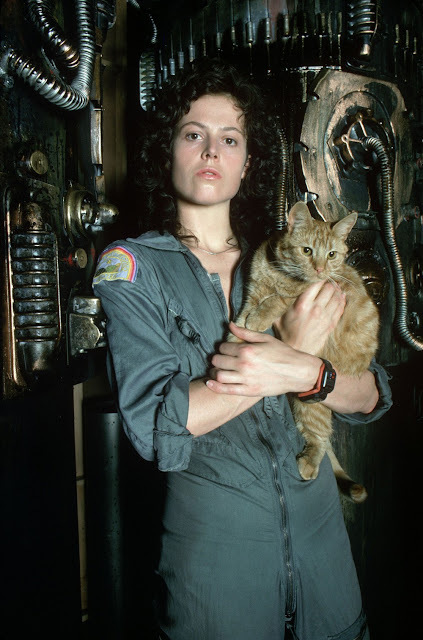 But in the original Alien it was apparently a couple Casio F100's put together on the same band. So much rendering to do. 0 to 536, and then 936 to 1361.